Provide comfort for the family of Ethel Timmons Willard with a meaningful gesture of sympathy. Funeral services for Ethel Timmons Willard, 82, will be at 2 p.m. Thursday, February 21, 2019 in the chapel of Hughes & Wright Funeral Home. The family will receive friends beginning one hour before the funeral. She will be buried in Evergreen Memorial Gardens. She was born in Cordele to James Rhollie Timmons and Nannie Mae Thomason Timmons. She is the widow of Jackie Lee Willard. She is preceded in death by her sons: James Wesley Willard and Jackie Dennis Willard; and her siblings: Ruth T. Clayton, James L. Timmons and Marvin Timmons. Mrs. Willard was a Baptist and enjoyed collecting antiques. She was a former ceramic shop owner and an avid reader. 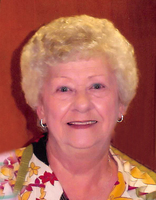 She was a retired insurance clerk for Crisp Regional Hospital. She is survived by her sister: Faustine (Grady) Wiley of Cordele; her grandchildren: T. J. Willard, Erica Willard Chamber, Elizabeth Willard and Natalee Willard; two great-grandchildren and several nieces and nephews. To send flowers in memory of Ethel Timmons Willard, please visit our Heartfelt Sympathies Store. We encourage you to share your most beloved memories of Ethel Timmons here, so that the family and other loved ones can always see it. You can upload cherished photographs, or share your favorite stories, and can even comment on those shared by others. Provide comfort for the family of Ethel Timmons Willard by sending flowers. One of the most precious sweet women I've ever known. She has shared much laughter and joy with so many and is most certainly missed already.... Prayers of comfort for you Ms Faustine, neices, nephews, grandchildren and great-grands. She loved you each and every one, and remain faithful to those sweet memories.... Go rest High on that mountain!! Your glory and family await you.... Rest In Sweet Peace Ms Ethel. Faustine and family, so sorry to hear about Ethel Mae. Our thoughts and prayers are with the family. Dear Tine and family. Please accept our sympathy for the loss of Ethel. She was a joy to be with. We have so many fond memories of her and all of you. We had a lot of good laughs and a lot of good times together back in the "good old days". Ya'll are a special part of our lives. We will miss her and may God bless all of you at this time. RIP, sweet Ethel. My deepest sympathy to Ethel's family, and many friends. She was a beautiful, kind, and caring lady.My prayers for comfort and peace during the days ahead.May God bless.